When I was in high school, I was told that I could no longer wear a skirt to class because the girls in my school were wearing them ‘inappropriately’. Now, as a first-year psychology student, I have come to the conclusion that this ban disregards female students’ right to express their femininity. I question how this gender disregard can be attributed to psychological explanations, and how we as a society can allow this to happen? I was told in my first lecture at university that ‘there is no point studying psychology if you’re not going to change the world with it’. I have made this my every intention; first port of call – discussing the ban on school skirts. Girls are banned from wearing skirts in 63 UK secondary schools (see www.schoolskirtban.co.uk). Which means in 63 schools girls are denied the right to fully express their gendered identity. I now ask: Is this ban a harmless way to regulate the appearance and behaviour of schoolchildren, or it is causing schoolgirls as young as 11 to succumb to a vision of patriarchal ideology? Clothing is not simply a body-covering-tool but a contribution to our identity formation, which is especially crucial in school-aged children where this process is most prominent (Erikson, 1968). In 1999 legal action was taken against Whickham School regarding their refusal to allow females to wear trousers. I find it astonishing how even today, 17 years later, I am now protesting for schools to allow skirts. When will women finally be able to stop fighting against the appearance ideals of education authorities? The headteachers of secondary schools in the UK have given reasons for their decision to ban skirts: ‘[skirts are] distracting for male pupils’ (see tinyurl.com/q5rp6og), ‘youngsters are placing themselves in undignified situations’ (see tinyurl.com/z5b2hdh), ‘We do not want our girls going outside with a 'come-hither look’ (see tinyurl.com/z9wybjp): In my opinion, these comments epitomise the distortions in gender perception, appearance and identity in our society. When a young girl cannot wear a skirt without being accused of being undignified, sexually provoking and distracting, I feel this marks a crisis for 21st-century gender perceptions. Some may argue that uniforms enforce unwanted gender binaries, and state that masculinity and femininity is imposed through the use of trousers and skirts. 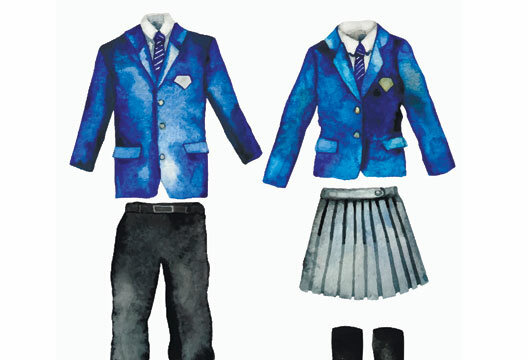 Conventional gendered dress is a hallmark of school uniform tradition, and to neglect this would mean to fully neglect the existence of gender binaries. I urge schools to celebrate our differences and teach schoolchildren to embrace whatever gender they identify with.